^ チェチェン語: Царнаев Анзор-кIант ДжовхΙар および Царнаев Анзор-кIант Тамерлан. • a: "Richard H. Donohue Jr., 33,... was shot and wounded in the incident... Another 15 police officers were treated for minor injuries sustained during the explosions and shootout". ^ Suburban police played a key role in bombing investigation. Boston Globe. (April 25, 2013). http://www.bostonglobe.com/metro/regionals/south/2013/04/24/from-boston-watertown-suburban-police-played-key-role-bombing-investigation-joined-purpose-police-respond-from-near-far/XIsRWAGRpFUgCnNZESqbmJ/story.html 2013年4月29日閲覧. 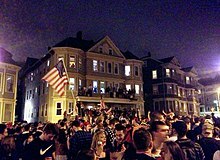 "By 6 p.m. Friday, Governor Deval Patrick suspended the “shelter-in-place” order for Watertown, Belmont, Boston, Brookline, Cambridge, Newton, and Waltham after the manhunt came up empty." ^ Gunfire heard in search for Boston Marathon bomb suspect. Reuters. (April 19, 2013). http://www.reuters.com/article/2013/04/19/us-usa-explosions-boston-shooting-idUSBRE93I0GQ20130419 2013年4月19日閲覧。. ^ Boston Marathon Manhunt: Search for bombing suspect is law enforcement's first major test of post-9/11 training. CBS News. (April 19, 2013). http://www.cbsnews.com/8301-504083_162-57580474-504083/boston-marathon-manhunt-search-for-bombing-suspect-is-law-enforcements-first-major-test-of-post-9-11-training/?utm_medium=twitter&utm_source=web 2013年4月19日閲覧。. ^ Dzhokhar Tsarnaev Criminal Complaint Offers New Details In Boston Marathon Bombing. Huffington Post. http://www.huffingtonpost.com/2013/04/22/dzhokhar-tsarnaev-criminal-complaint_n_3133865.html 2013年4月26日閲覧。. ^ Boston suspect Dzhokhar Tsarnaev remains in critical condition. The Washington Post. オリジナルの2013年5月5日時点によるアーカイブ。. https://archive.is/20130505004756/http://www.washingtonpost.com/national/boston-suspect-dzhokhar-tsarnaev-remains-in-critical-condition/2013/04/22/040bd43b-3607-4275-bc6c-57b04ced6332_video.html 2013年4月22日閲覧。.